The tech tree of Railway Empire consists of two branches: “Trains and Locomotives” and “Business and Construction”. Each one of them contains 100 technologies, plus 41 engines in the “Trains and Locomotives” branch. You can find the technologies in Tome here: Technology/Business or Technology/Trains & Locomotives. If you would like to create your own technology or even a whole technology branch, you will have to define a Type for that new technology, so it can be assigned to the right branch. Caution: The technology type cannot be changed afterwards. In order to make a new technology researchable and to make sure that it will be displayed correctly, you have to keep a couple of things in mind. 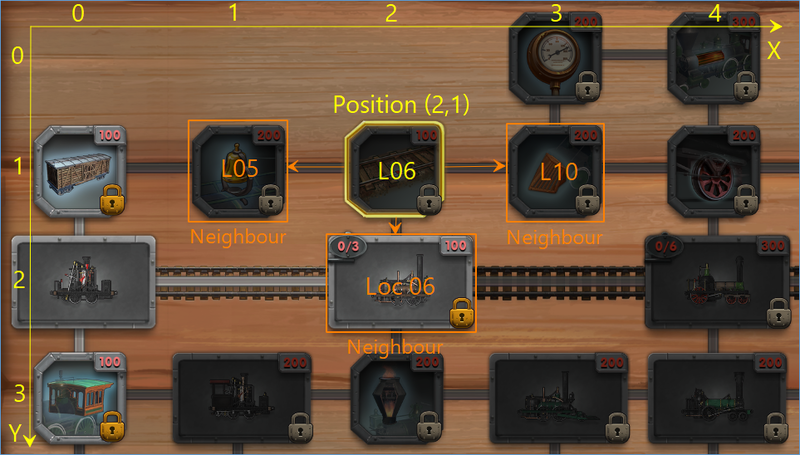 The Railway Empire tech tree is a grid that follows a “neighbour rule”: Each technology has a position (X and Y values) in that grid and at least one neighbouring technology. The neighbouring technologies have to be specified correctly under Neighbours in Tome. And of course, you have to adjust the neighbours for the already existing technologies, for example if you want to create a new technology between others. 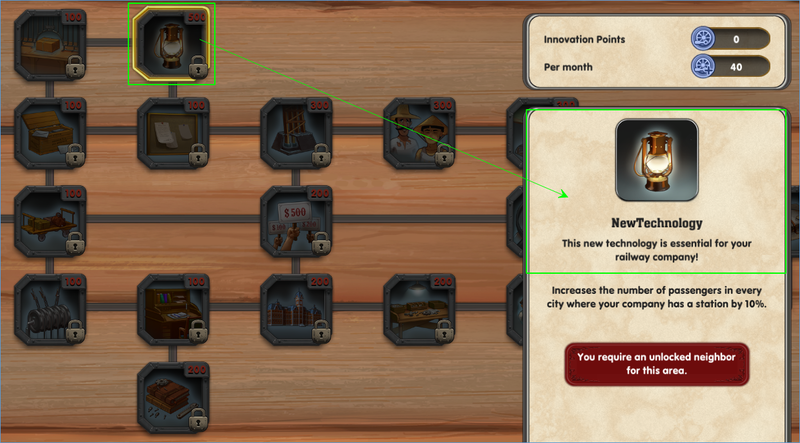 Furthermore, the correct position matters, so the technology will be at the right spot of the grid in-game. Therefore, you have to define X and Y values under Pos. Keep in mind you may have to adjust any technologies that may be moved by your changes. One last point to be taken into consideration: The Legacy Type. This value defines if a technology is RESEARCHABLE, already RESEARCHED or INACTIVE. 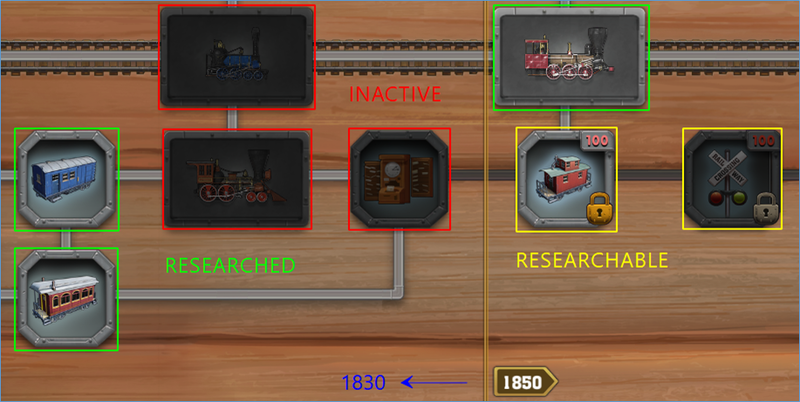 In Railway Empire only one section of the tech tree will be active per era. Everything in the relevant era can be researched. Everything that is in front of it may have already been researched, can still be researched or is inactive. And everything after that era is inactive theoretically – at least according to the original concept of the game. 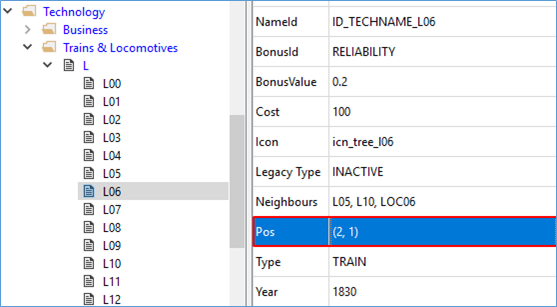 So, just that you know how the tech tree is structured, which technology has which ID and which neighbour (Neighbours), which position (Pos) your new technology has to have and how the Legacy Type has to look like in its original state, we will provide you a schematic overview of the Railway Empire tech tree. You can find this overview here: Archive (Railway Empire_Techtree). In order to create a new technology the easiest way might be to duplicate an existing record of the desired branch of the tech tree. 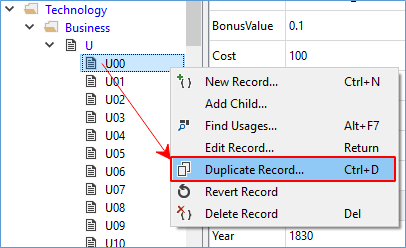 You can archieve this by right click an existing record and select Duplicate Record… with a left click. After naming it you can confirm and a new entry should be added to the list. The name of a record is independent of the name of a technology. 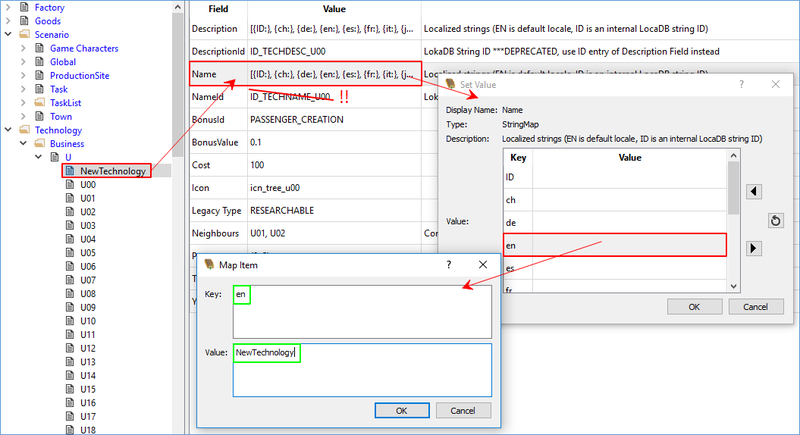 The name of the technology can be edited under Name, which can be done by double clicking the Name-Field. A table will open that will show you a language Key on the left hand side and needs your input (Value) on the right hand side. Your input should be next to your corresponding language Key (e.g. en is short for English and de is short for German). Caution: The ID behind NameId has to be deleted to make the game use your custom input. This is true for all strings you might change in Tome. 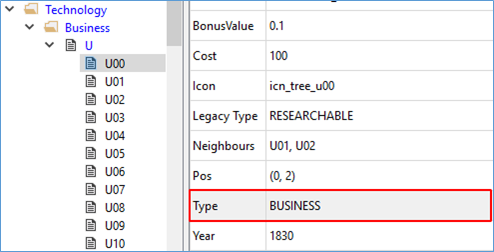 The same goes for the Description of a technology, as there is a value called DescriptionId which has to be deleted to make the game use your custom input. As soon as the NameId and/or the DescriptionId has been deleted and you already made your custom input for your language, your technology should bear your name and/or your description and should be in-game. you want this technology to unlock a new engine. The BonusId and the BonusValue are describing the impact of a technology. What is the desired effect of this technology? And how much of an impact should it have? 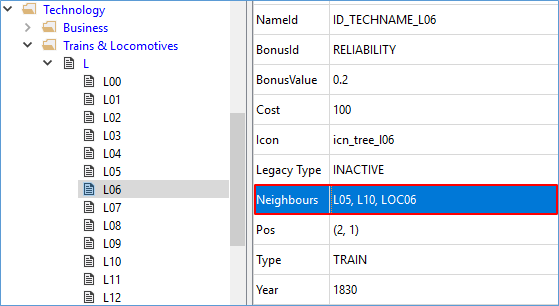 You can look into the possibilities of effects here: Archive (RailwayEmpire_Techtree). Sadly, is not possible to implement your own 2D images into the game and thus, you cannot add your own images to the Icon of a technology. Instead, you can select an icon of our default Railway Empire collection. A full list for them can be found here: Archive (RailwayEmpire_Icons).